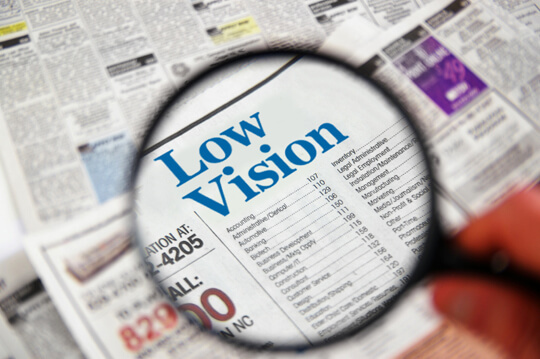 What is the condition known as Low Vision? Low vision is impaired vision that cannot be remedied by using standard eye glasses, contact lenses, medical surgery or treatment. There are over 2 million Canadians that suffer from low vision. Mountain Eye Care can help you if you have Low Vision! People with low vision can still manage daily tasks with the help of vision tools, optical solutions and electronic devices. Mountain Eye Care Hamilton is the only clinic in the Hamilton and the surrounding area that specializes in helping visually impaired patients maximize their remaining vision. This care involves an evaluation and the use of solutions called low vision aids that may include digital magnification devices, corning glasses and telescopes that will help you achieve realistic objectives and manage daily tasks. The Assistive Devices Program can help with the cost of these items and covers between 75-100% of any required devices. Information on other helpful resources in the Hamilton area, such as vision rehabilitation services and help to access the Assistive Devices Program if eligible. To correctly learn how to use low vision devices requires patience and practice. The Mountain Eye Care Hamilton team is readily available to assist our clients in adapting to the devices. As our clients vision or lifestyle changes, so do their needs. Let Mountain Eye Care continue to work with you meet your individual needs. We will assist you with accessing the Assistive Devices Program for funding and fill out all the necessary paperwork and submit that to the government on your behalf. Any approved funding will come directly to our office. We are Hamilton’s only ADP approved office and we are happy to provide our patients with this helpful program! Contact Us Today to book an Appointment with one of our Low Vision Specialists at 905-389-4201.